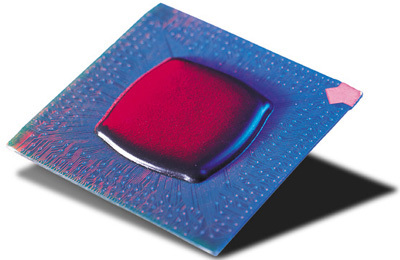 Dam and Fill is a two-step process for fully encapsulating high I/O count, wire bonded die. Its first step consists of dispensing a dam around device perimeter. During the second step, fill material is dispensed in dam center. An alternative to dam and fill is a Glob Top process. Glob Top does not utilize a dam; therefore, the process covers a varying area on substrate. Typically, Glob top is used on low cost products and when wetted area is not critical. A successful Encapsulation process results in complete encapsulation of wire bonds without air entrapment. Example of Dam and Fill. Damming materials typically have a high viscosity with abrasive fillers. Based on the abrasive factor, Precision Auger Pump is recommended due to being machined from carbide, thus offering excellent wear resistance. Additionally, augers are available in a variety of configurations to suit process requirements. Glob top and fill materials vary in composition. They may not include an abrasive component like the damming step. For less abrasive fluids, Progressive Cavity Displacement (PCD) pump is recommended because of its excellent volumetric repeatability. This pump feature makes for highly repeatable, air-free encapsulations. If fluid composition is highly abrasive, Precision Auger pump is a good choice. Alternative materials for Dam and Fill are UV curable fluids. These materials are commonly used in LED or optical applications. These fluids are not abrasive and are compatible with NCM5000 Jetting Pump or PCD Volumetric pumps. Encapsulation processes are typically heated to help fluid flow and avoid air entrapment. All platforms can be configured with heat in work area. An inline system can incorporate pre-heating and post-heating for optimized throughput. Multiple pumps can be mounted on some platforms for applications like dam and fill. Dispensing Dam and Fill with Precision Auger Pump - video. Dispensing Multilevel Dam with Volumetric PCD Pump - video. We also offer a retrofit kit for the Volumetric PCD Pump Series, Precision Auger Pump, and NCM5000 Jetting Pump so you can integrate the pump into your platform. Retrofit kits come complete with a controller and the necessary interface cables and mounting.